On March 7, 2017 Bruce Thompson’s team came to the Virginia Beach City Council seeking about $6.5 million in taxpayer money for Cavalier Associates, LLC, the investment group he formed to buy and renovate the iconic Cavalier Hotel. Combined with earlier requests, the money would push total public funding to the development and related projects past $40 million. Cavalier Associates, LLC submitted nearly 60 pages of documentation during that City Council meeting, and at a meeting two weeks earlier with the Virginia Beach Development Authority, which also had to sign off on the deal. The documents outlined why the Cavalier needed the money, how the project benefited the public and explained the ways it qualified under state tourism grant rules. Robert M. Howard, chief investment officer of Cavalier Associates, Gold Key/PHR, Heritage Investment and other Thompson entities, affirmed, in writing, that “no official or employee of the City of Virginia Beach,” had an interest in the proposed development, according to documents submitted to the Development Authority on February 21, 2017 and, two weeks later, to the City Council. In fact, at least two people on the VBDA at the time were and continue to be financial partners in the Cavalier Hotel project, according to a review of Cavalier Associates records, property deeds, financial disclosure forms, bank records and documents connected to a related $25 million bond proposal. 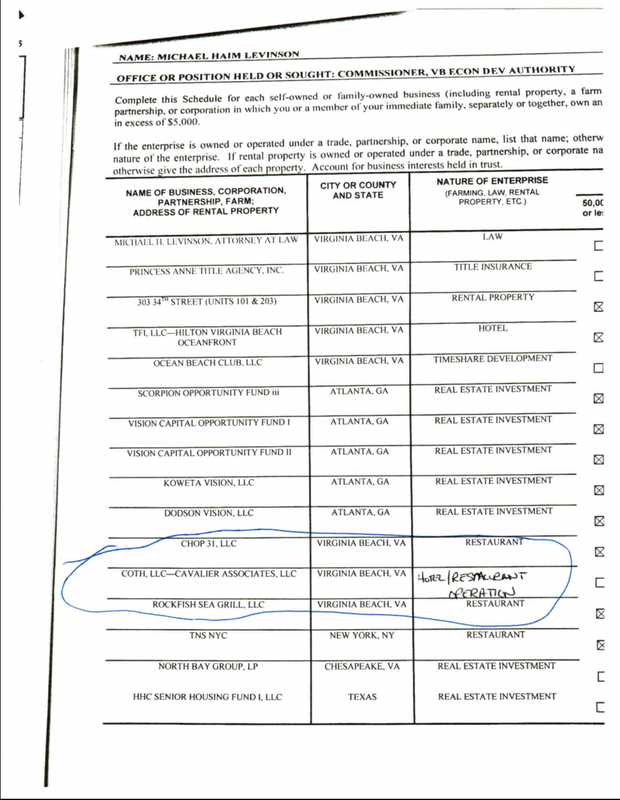 The records show that then-VBDA commissioner Michael Levinson is a partner in COTH, LLC, which was an original investor in the Cavalier in 2013 and his company continues as one of the partners. Levinson joined the VBDA in 2014, three years before Howard’s assertion. He left the VBDA in August when his term expired. VBDA member Bryan Cuffee, who has listed himself as an employee of Thompson’s Gold Key/PHR during his seven-year tenure on the VBDA, has had a stake in the Cavalier through a separate limited liability company since at least January 1, 2017 according to financial disclosure forms and bond documents. He joined the VBDA in 2011. Neither man mentioned their stake in the Cavalier project when Thompson’s team sought VBDA money on February 21, 2017, according to minutes of the meeting. Although both men abstained from voting, neither left the room during discussions or ever filed written disclosure statements outlining their conflict, which is required by law. According to official minutes of the VBDA meeting Cuffee said he abstained because of his role as a director of TowneBank - which loaned at least $77 million to the Cavalier team - but made no mention of his connection to the Cavalier. Levinson, also a local TowneBank director, said only that he had a “business relationship” with the Cavalier. These are not harmless omissions, nor are they unusual in Virginia Beach. Virginia Beach City Attorney Mark Stiles refused to comment on whether VBDA members are “city officials.” Robert Howard, chief financial officer for Cavalier, LLC, did not return three phone calls seeking comment. What we do know is that the VBDA commissioners and the entire staff are paid with city dollars. All staff work out of city-owned facilities, all money used for grants is city money and the head of the development authority answers to City Manager Dave Hansen. At least Warren Harris did until this week, when he resigned abruptly in the face of a city audit. A city staff member, talking only on background to make sure the facts surrounding the VBDA disclosures are accurate, said the forms weren’t designed to be a “gotcha” for developers and there is no legal requirement for them to fill them out. Instead, the forms were created to protect elected officials in the wake of Mayor Will Sessoms being found guilty of criminal conflict of interest charges in 2015. But neither Sessoms’ guilty plea nor the city’s changes did anything to curb the connections between Thompson’s companies, TowneBank and elected and appointed officials. The number of conflicted officials is staggering. Sessoms and Councilmembers John Uhrin and Rosemary Wilson all abstained from voting at least once on Cavalier-related issues because of conflicts. So did four members of the VBDA; members who either were on Thompson’s payroll, had service contracts with his hotel or had ties to Townebank, which loaned $77 million on the project. In addition, VBDA Chairwoman Dorothy Wood and her son and business partner, City Councilman Jim Wood, obtained $5.6 million in loans from TowneBank on Feb. 1, 2017, three weeks before the Cavalier came seeking their votes for the additional $6.5 million grant. All of these things raise serious questions, and directly impact the financial interests of taxpayers. How? Well, if conflicted VBDA members decide that taxpayers aren’t being served and stop throwing more money at the Cavalier, they face a difficult choice. If they side with the citizens they risk upsetting the most powerful bank in the region, a powerful developer and, potentially, their own financial interests. I reviewed every vote made by the VBDA over the past decade. The records show that in the past 12 months alone, Cuffee, Levinson and member Stephen McNulty have been forced to abstain on about half of all VBDA votes. McNulty is a vice president of TowneBank who was appointed to the authority in 2016. Besides doing legal work for Thompson’s hotels, and being a partner in the Cavalier, Levinson is also a director of TowneBank. Quite the trifecta. After reviewing the files, one obvious question jumps out: If they can’t vote, then why are they on the VBDA in the first place? The only answer seems to be that Thompson, Cavalier Associates and TowneBank want them on the board. This is exactly the type of conflict the laws are designed to avoid and should be enough to spark an investigation by the Commonwealth’s Attorney’s Office, and not just an internal audit. There is plenty for investigators to probe. What we know so far is that when Cavalier Associates came to the VBDA and City Council in 2017 seeking public money, they submitted information that never mentioned that two members of that very board are partners in their project and would benefit from VBDA money. When those two partners, Cuffee and Levinson, attended the meeting but did not vote, they never followed state disclosure laws, and never announced their true connections to the development. The reasoning behind the statute is simple. The public has a right to know the exact nature of any conflicts. That didn’t happen here. These conflicts take on special significance as both city bodies are tasked with deciding who will win public support for the upcoming Pier development project. As with the Cavalier, tens of millions of public and private dollars are at stake. And, as with the Cavalier, a group of investors led by Thompson is vying to win support from a City Council and Development Authority loaded with people connected to him and his partners. And TowneBank is expected to be part of any financing, according to conflict opinions already being sought by council members. Public financial records underscore just how important continued support from the VBDA is to the fortunes of Cavalier Associates, LLC and TowneBank, which loaned tens of millions of dollars to the Cavalier and its partners. The best proof of that comes from a $25-million bond document drafted by the Virginia Small Business Financing Authority and Cavalier Associates in April of this year. The draft prospectus - which was never issued - was designed for investors who could invest in what would essentially be junk bonds that carry high risk and high potential returns. The document specifically said that investors would be at significant risk if the City Council or VBDA were to stop the tourism grant program that has pledged millions of taxpayer dollars to Cavalier, LLC. Just so there is no confusion, if the VBDA stops supporting the Cavalier project, investors are at risk. That should give every taxpayer - and city employee - pause. It should also prompt the immediate resignation of every VBDA member connected to Thompson, TowneBank or any other project that receives millions of dollars from the VBDA. It probably won’t. But if it doesn’t, it should propel a massive turnout at the polls to make sure voters do what the public officials don’t seem to have the integrity to do for themselves. Part Two will look at never before released details of the Cavalier application and approval process, giving the public a warning of what may lie ahead with the Pier. It also provides a blueprint for voters to ask important questions of their elected officials. Want to read more about what passes for good government in Virginia Beach? Check out this piece about former VBDA member Linwood Branch. And this investigation into the curious case of Green Flash Brewery. Oct 15 Once A Safety Patrol Girl. Always A Safety Patrol Girl.